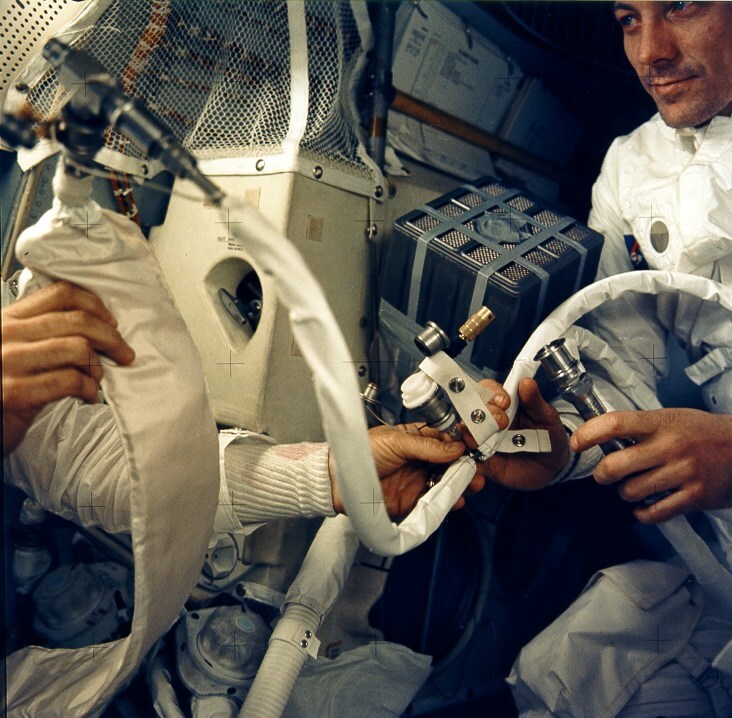 On the left, an astronauts holds in his right hand the feed water bag from the Portable Life Support System (PLSS). It is connected to a hose (in center) from the Lunar Topographic (Hycon) camera. In the background is the 'mail box', a jerry-rigged arrangement which the Apollo 13 astronauts built to use the Command Module lithium hydroxide canisters to purge carbon dioxide from the Lunar Module. I've been through the transcript and a few other sources and they all indicate that the hoses concerned are from the suits - there's no mention of cannibalising the Hycon that I can see. Anyone any idea where the ALSJ got their information? Re: Apollo 13's CO2 scrubber components - ALSJ error? Pass it on to Eric and point it out, he likes research like this. In the absence of other answers I may do, but I know he's busy so was hoping not to bother him!